So much for the notion that rosé wines are suited only to summer drinking. As the fastest growing wine in the U.S., and one of the most versatile, rose’ has stepped up to take a permanent place at the table, regardless of the season or what’s on the menu. That said, though, you have to admit there really is something about firing up the grill that makes you crave this quaff. And Loudoun County, known as DC’s Wine Country, boasts an abundance of charming, refreshing rosés. Here is a guide to 19 wineries where you can indulge, listed by Loudoun County’s geographical clusters. Most of Loudoun’s rosés are in the $22-27 range, but two on the lower end are also two of the best: Chrysalis’ Mariposa ($17) and Boxwood Estate Rosé ($19). These are heady times for rosé, and many sell out quickly, so if rosé’s what your heart’s set on, call ahead to check availability. Hand-harvested chambourcin grapes from Amber Creek and Haverty vineyards coupled with estate Albariño comprise Bluemont’s refreshing, off-dry Rosé “The Donkey” 2017, $25. Whole cluster pressing lends fruit forward notes of strawberry and cranberry that intertwine with hints of lemon grass and a delicate acidity. The Albariño grape is a relative newcomer to the Commonwealth. It hails from Spain and imparts lime, lemon and grapefruit flavors when grown in cooler climates. You’ll need to join Bogati’s wine club to get your hands on their JB Winemaker Series Rosé 2016. In demand because of a certain Robert Parker score of 87, this 100% chambourcin is slightly off dry. If you’ve been waiting to join the club, now’s the time. Bogati is co-located with Mom’s Apple Pie and the Round Hill Arts Center at Hill High Marketplace, making for a nice afternoon of culture..and pie. Rosé of Cabernet Franc 2016 is 868 Estate’s entry in the category. Twelve percent merlot was blended in to enhance the color as the cabernet franc “bled off” very pale. Made in the style of a Provence rosé – that is, with flavors of red berries and dried herbs and maybe a touch of fennel, and vinified bone dry – this wine will pair well with interesting olives and cheeses, which is conveniently available Friday through Sunday at Grandale Vintner’s Table restaurant, just a few steps from the winery building. You could easily create a four-course dinner to pair with Breaux’ extensive collection of rosés. Start with a sparkler: Breauxmance 2015 is vidal fermented dry with a bit of cabernet franc. It’s dry, crisp, and light in body. Barrel Select Rosé 2014 is made of Bordeaux grapes. This light pink rosé is dry, crisp, with pleasant acidity and fruit. Merlot-based Rosé 2016 – After harvest, the fruit is held in bins before fermentation to get the most color and full flavor from the grapes, as is generally done with red wine. This makes it darker and a bit fuller-bodied. It is quite fruity yet still dry. Breaux’ unique Port-Style Rosé has a hint of residual sugar, and is made with cabernet sauvignon aged in oak for several months. This is lighter than a typical port-style wine but carries the most weight of the four. 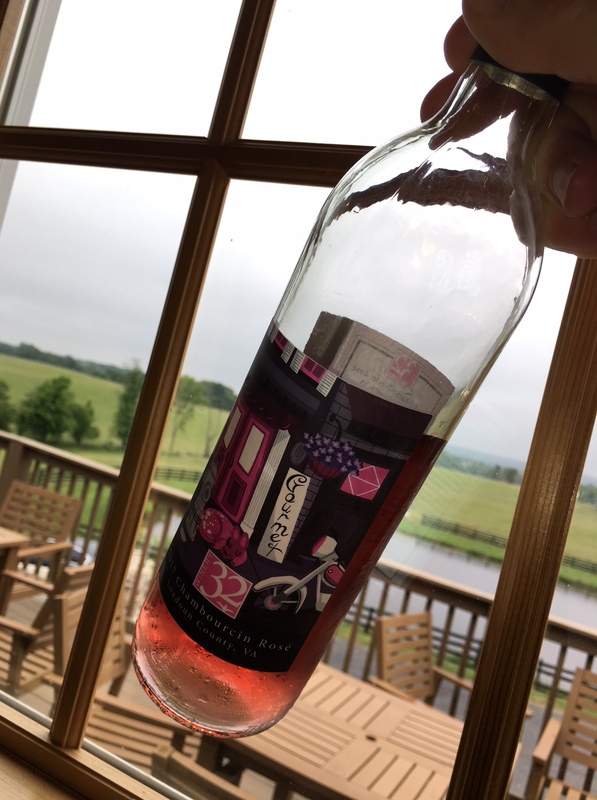 Doukenie’s first ever Rosé is vintage 2017 and made its debut in April 2018. A splash of merlot (4%) contributes to the beautiful pink topaz color. Sauvignon blanc, vidal blanc and pinot gris complete the blend. Made with estate-grown grapes, the wine shows exotic melon and butterscotch flavors and a creamy-crisp texture. This fun spot offers an eclectic mix of special events including Friday Bistro Nights, Vines to Wines Tours, the popular Greek Heritage Day and the Virginia Wine Country Half Marathon. Sunset Hills tasting room is set in a huge, imposing red barn, circa 1870 (rebuilt by Amish barn-raising specialists, we were told by the owner, Diane). The umpty-thousand square foot structure is home to a four-sided tasting bar, lots of open space with little gifties for purchase, plus an open second-story balcony, roped off for use by Sunset Hills Wine Club members. 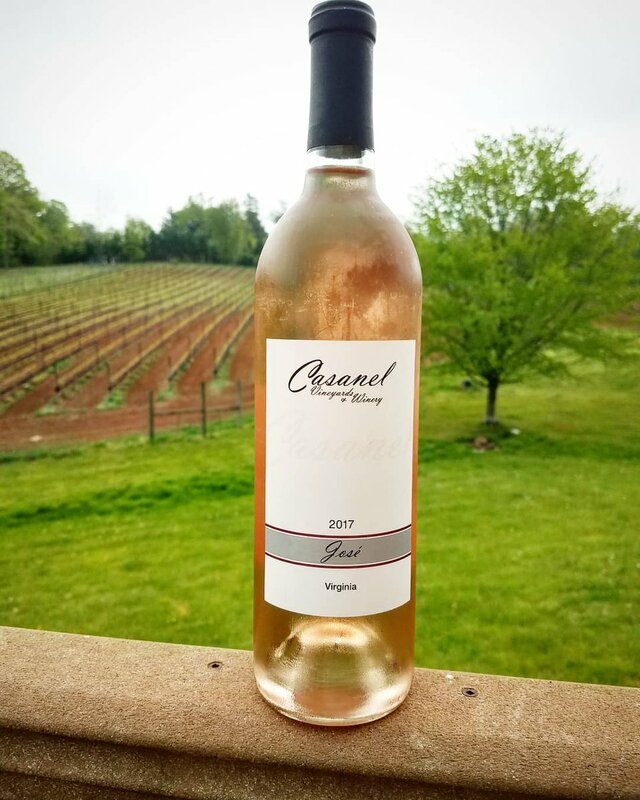 The grapes for Sunset Hills’ Cabernet Franc Rosé 2017 were grown at estate-owned vineyards here and in Woodstock, VA. A ripe style rosé, off-dry while still maintaining fresh acidity to balance out the fruit notes, the wine features flavors of strawberry-rhubarb tart, raspberry puree, a hint of tart grapefruit peel, and light citrus notes of clementine. Stylistically, 50 West’s Rosé of Sangiovese 2017 is crisp, refreshing, and austere. Vibrant notes of strawberry and hay are highlighted on the nose and also carry over onto the palate, furthered by rhubarb, white grapefruit, and a fresh acidity. The grapes were grown at Sunset Hills’ vineyard in Woodstock, VA. (50 West and Sunset Hills have the same owners.) Picked early in the season to retain the grape’s natural acidity, the sangiovese was harvested before the real threat of rain settled in. 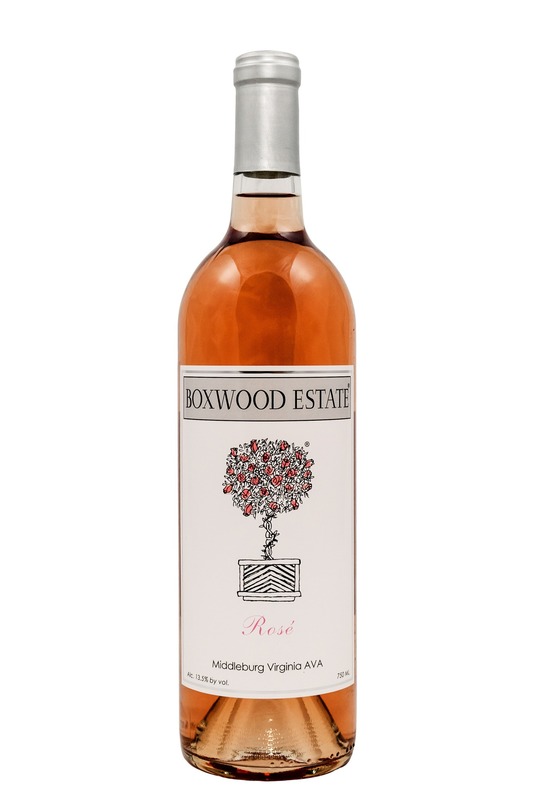 Boxwood’s Rosé 2017 is a blend of the winery’s five estate-grown Bordeaux grapes: cabernet sauvignon, merlot, cabernet franc, malbec and petit verdot. An elegant pink hue complements a bouquet of freesia and white peach. The balance of fruit and acidity highlights notes of strawberry, raspberry and nuanced pineapple. Its medium-light body shows a lengthy finish which lingers with a touch of stone fruit and floral charm. Chrysalis Mariposa 2017 has a scent redolent of fresh, ripe strawberry, watermelon, dark cherry and maybe a touch of sage. An initial surge of sweet strawberry and dark cherry is quickly tempered by the refreshing acidity that follows. Tannat, petit verdot, nebbiolo and norton make up the blend. After harvest, the chilled grapes were whole cluster pressed then fermented in steel to retain aromatics. Pair with goat cheese and black olive tapenade as a snack, or with a dinner of lobster paella. Though Creeks Edge Rosé 2017 was vinified with limited skin contact, the chambourcin grapes in the blend give a rich pink color to the wine. Two white grapes, vidal blanc and traminette, are the other half of the blend in this dry rosé that is highlighted by citrus notes and crisp acidity. The centerpiece at Creeks Edge is a silo staircase, with an interior that mimics the interior of a wine barrel, complete with oak strapped with metal. Upstairs is a private dining area and downstairs houses the winemaking operations. An on-site bistro satisfies any hunger pangs, with a menu that expands on the usual cheeses and meats to include flat-bread pizzas, fancy sandwiches and more. The tasting experience at Fabbioli is unique for Virginia. It’s conducted as a seated tasting led by an experienced wine educator, with each wine matched with morsels selected to show off what a well-chosen food/wine pairing can bring out in each. Fabbioli Rosé of Merlot 2017 is a quaffable wine – simple, tasty, and goes down easy. The scent is very distinct: full of zesty grapefruit, lemons, and spring blossoms with a hint of young strawberry. The wine is well-rounded and balanced, bursting with more grapefruit and jazz apples, and very zesty. Made of 100% merlot grapes. A semi-sweet interpretation of rosé awaits you here. Estate-grown vidal blanc and merlot make up the blend of Hidden Brook Rosé 2016, $23. On the nose and palate, you get fresh strawberries and a hint of raspberries. Dating back to 2001, Hidden B rook is one of Loudoun’s ten original wineries and is housed in the woods in a log cabin the owners and friends built by hand in 2002. The naturalized landscaping among shady, mature pines, dotted with picnic tables, feels very Southwest U.S; truly a different feeling than every other Virginia winery. Tarara produces two rosé wines, both field blends of cabernet franc, merlot and cabernet sauvignon from their Road Block of Nevaeh Vineyard. A field blend is when the grapes in the vineyard are not brought in separately at the harvest. Boneyard Rosé is richer, darker and more mouth filling. It was crafted using mostly pressed juice making it richer and fuller. Tarara Rosé is all free run juice with no skin contact and in turn is fresh, complex, clean and perfect for summer. In summer 2014, Winery 32 opened on 32 acres. Thirty-two peach trees line the drive. The property is spacious and rolling, with wood fences and a lovely pond in the foreground from your perch on the wrap-around porch. Inside, windows let the light shine on high top tables and a ceiling-high stone fireplace. Winemaker Doug Fabbioli was the consultant for Winery 32 as they got their start. Their Rosé is a dry wine, highlighted by notes of red raspberries, strawberry, and mango, perhaps coming from the 5% vidal blanc added to the chambourcin in the blend. Both grapes were grown right here on the farm. 2017 Jose Rosé is made from hand-harvested cabernet sauvignon and merlot grown locally in Loudoun County and a percentage of estate-grown carménère. A blend of both direct pressed and saignée juice, the wine was stainless steel fermented and aged. Bone-dry in the Provence style, the wine is soft, pastel pink in color with vivid watermelon, strawberry, and floral notes and a hint of cherry blossom and rosé petal. Some creaminess provides medium body, but overall crisp and fresh with a long finish. Stone Tower presents two rosés. The Estate Rosé 2017 is bone-dry and medium-bodied. Made in limited quantity, it is crafted with 55% cabernet sauvignon, 28% merlot, and 18% cabernet franc. This wine was barrel fermented and aged in french oak for 6 months, resulting in a full, rich flavor. Wild Boar Rosé 2017 is a single-vineyard wine from the Monticello AVA. It is 100% malbec, fermented and aged entirely in stainless steel. Dry, crisp and clean, this fruit-forward wine really refreshes. The view at The Barns at Hamilton Station takes in acres of manicured fields and a pond in the distance, all framed by woods. Live music jazzes things up every Friday, Saturday and Sunday. Vinified dry, The Barns’ Rosé is a blend of cabernet franc and merlot. In 2017, The Barns won the prestigious Governor’s Cup, the highest award a Virginia wine can achieve, for their Cabernet Sauvignon 2014. Willowcroft is Loudoun’s first winery and has possibly the coolest tasting room, in an old horse barn. Owner/winemaker Lew Parker has been creating award-winning wines since the early ’80s. 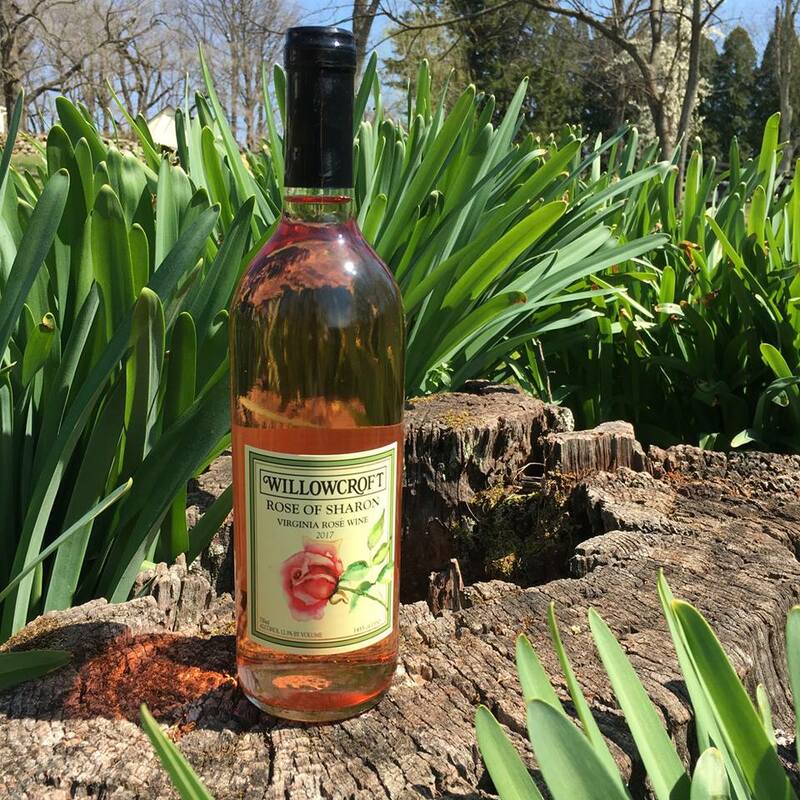 Blended with a majority cabernet sauvignon complemented with a touch of cabernet franc and chambourcin, Willowcroft Farm Rosé of Sharon 2017 is an estate-grown dry rosé. Zephaniah Farm Rosé 2016 is crafted from estate-grown cabernet franc and chambourcin. Made using the saignée technique, the wine is light pink in color with a rich mouthfeel from aging sur lie (unfiltered) in neutral oak barrels. It is off dry and crisp. Zephaniah’s seated tastings take place in the family’s circa-1820 manor house, in the living room, library, and main room. Enjoy your pink surrounded by family curios and antiques. Get to Know Rose’: the fastest-growing wine in the U.S.
As wine drinkers’ tastes evolved away from the sweetly uncomplicated white zinfandel that reigned in the past, winemakers focused their efforts on making drier, more subtle expressions, reminiscent of the crisp rosés of France: Rosé d’Anjou, an appellation in the Loire, often made with Cabernet Franc, Cabernet Sauvignon, or Malbec; and the rosés of Provence, the largest wine producing region in the world dedicated to pink, where a multitude of grape varieties are permitted in the blend. There are basically two ways to make wine pink: one, pretty obvious, mix your red wine with your white wine. This is called blending. The other method is to quickly drain off the juice of recently harvested grapes before the skins impart too much color. This is called bleeding, or more elegantly, saignée. Along Loudoun County’s Wine Trail, both methods are used, and you’ll find a range of flavor profiles, from robust to delicate, fruity to flowery, and semi-sweet to off-dry, to bone-dry. There is a time and a place for each of these styles: a full-bodied rose’ might pair well with smoky barbecue while a light, dry style goes beautifully with grilled fish or a salad. Take some home and do some experimenting. « The Farmers Market is Back With a New Twist!